For years the general public has been tantalised by stories of UFO sightings and even, in a few cases, actual alien encounters. Proof of the claims, however, has been disappointingly elusive. More often than not, it simply comes down to taking a person’s word for it. In a few instances, photographs have been taken, but, inevitably, questions always arise about their authenticity. Hard physical evidence has been almost the Holy Grail of UFO research. But some now believe they have it. Reports from people who claim alien abductions first became widespread in the 60s and 70s. Often, the supposed abductees would describe experimental procedures that the aliens had allegedly performed on them. Sometimes, they would even insist that the aliens had inserted something inside them. Soon, these “alien implants” had become a staple of UFO lore. Roger Leir was a successful Californian podiatrist (foot doctor) when he first heard stories going around about people who claimed to have alien implants inside them. Although he had believed in UFOs since he was a child, many of the newer developments in UFO lore, such as reports of alien abduction, struck him as fanciful. He didn’t believe for a second that any of the alien implant stories were true and he decided to disprove them. When he heard of a patient complaining that she had an alien device implanted in her body, Leir offered to do the surgery required to remove it for free. To his amazement he discovered that she really did have a mysterious object inside of her after all. For him, it was the beginning of a journey of discovery. Since then Roger Leir has become the go-to guy for alien implant removal. He is inundated with inquiries from people who believe they have something strange inside of them. Leir and a small panel of scientific colleagues evaluate the reports they receive but, because of limited funds, can follow up on only a few. 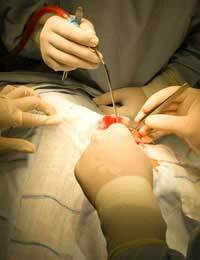 Nevertheless, over the years, Leir has performed over a dozen surgical operations designed to remove anomalous objects from inside people’s bodies. Some of these operations have even been performed on camera and the footage has been shown in television documentaries. Experience has shown that, usually, the objects that are supposedly alien implants are metallic. Some emit radio frequency waves. Many are attached to nerve endings within the body, causing patients to cry out in pain when they are removed, even after they have been anaesthetised. Leir has found that sometimes there is a scar in the external part of the body where the implant is located, but often there is not. While inside the body, the implants are often wrapped in a protective membrane. Of course, several of the "alien implant" objects which have been removed have been sent to laboratories for analysis. Alas, none has been so definitively “alien” that it represents irrefutable proof of extra-terrestrial contact. Perhaps the alien technology is simply beyond our understanding, just as one of our own electronic devices would be if we handed it to a tribe in the stone age. Some also suspect that the implants cease functioning once they are removed from the body. Leir performs surgery only on patients who have not previously undergone hypnosis, because he knows that UFO sceptics will claim that the hypnotic experience induced them to imagine all kinds of fantastic things. Many patients do undergo hypnosis afterwards, though. In these hypnotic regression sessions, reports of the patient sighting UFOs, or even being the victims of alien abductions and carried away in them, are very common. If the "alien implants" really do represent alien technology then, what is their purpose? The most sinister suggestion is that they are some kind of mind control device. Since the victims eventually sought help for their condition, if that were so, they would seem, at the very least, to have been of limited effectiveness. Perhaps they are just monitoring devices which send back reports to UFOs and the aliens on the victim’s location and condition? Stories of repeat alien abductions, even lifelong abductions, are very common. This suggests that the aliens are interested in monitoring specific individuals. We have no way of knowing what makes them choose one person rather than another for their invasive procedures. The idea of aliens implanting devices inside our bodies is deeply frightening. We can only hope that, if these alien implants really are of extra-terrestrial origin, they can one day offer clues about who or what their creators are, and what their intentions might be. I was brought up in a household where my had for sure seen a UFO when she was young. We were lead to believe that they were outside our house on odd occasions. One day, when I was around 10 I was walking across a field, a ploughed field with my bike. The ground was so ploughed and hard I couldn't ride it. I just remember fainting and waking up with a throbbing thumb. This thumb has always been shirt and fat compared to the other. I am now 49 and my fat thumb is very sore, as if I have something in it. Maybe I'm just going mad?! It is a strange one to consider. I would like to believe, but I’m not sure? More recently I have been having a few odd night time encounters. I have found strange materials in my bed and under my bed and I have also found some sort of tape stuck to various places on my body after dreaming of being paralyzed and a group of people standing behind me. And I think they may have inserted something, somewhere you wouldn’t want it! More recently another dream about a strange house and two really odd looking guys with no hair and shirtless, they looked like twins and I couldn’t place their nationality as they had really weird eyes. One sat on my chest, and the other held my legs. I remember begging for them not to kill me, but when they spoke I realised I had never heard a language like that before and communication was pointless. That was it. I have no memory of what happened next. Not particularly scared because I would love to make contact if it was possible. I don’t think about it often, but my housemate is convinced that something is in the house on occasion, and I have seen unmistakeable shadows passing by outside my door and there have been lots of odd noises. Interestingly both of my dogs have gone suddenly and permanently deaf? And I can’t stop thinking ‘how convenient that they can’t be heard’ Oh well, that’s my bit! I have had several experiences over a period of time. I can tell youwhat some of them look like. Triangle head is one. They communicated with me. I have photos.I tried to share some, but decided to keep my own collection for now. People will speculate and think it is Photoshopped when authentic so need to write it all down. I made some audio recordings and someone mentioned earlier in these comments; loud sounds, like horns, city, traffic and hellicopter sounds we're heard on the recording when I was in the country with maybe a distant dog barking.They showed me things.I'm in Southern US. Some photos I took in Indonesia with several types of aliens in the photo. They showed me by taking over my computer and taking me to the photo.I took photos flying over Taiwan taken by a burst within l minute or less ( see time on photo) in the photos are photos of someone's hairline being pulled back and bruises on skin then it went to more pics of Taipei at night.I have an unexplainable injury to my arm/ shoulder right now. The surgeon plans to do a MRI and go in to break up scar tissue he thinks is the problem, but something else is going on. I can't explain how I am injured, but my subconscious tells me it was related to this subject matter, but that is not something you can tell a doctor. I will see what he finds. @ Jonez - it might have been something that happened to you when you were a baby. It's likely to have come from a fall, or even a cut when you were being born. Anyhow, it's more likely to have a rational explanation than a UFO-based one. Beware of listening to flaky implant stories - they are not true. I have a curved scar behind my right ear, i have never had surgery or trauma to my head to leave such a scar. Any advice or comments please. Well it is good to know I am not the only one. I seen a small Robot with a black shield about 2 feet tall. then I went to sleep. the next day I had 4 tiny pin holes on my left lobe on my head and two pin holes on the right lower lobe. $ days later My back was so sore I could hardly walk. this went on for several months. This was consistence for over a period of several months. Recently I am able to see out of my left eye double 3-D and my eye is blurred it looks likeTINY CAMERA. I always know when they cam because my back hurts real bad...resistance from me I am sure. I believe I am being used as a camera fro them, I also believe that they are research our way of life except I am in the remote wilderness of Belmont, Arizona. I also move spirits to the after life as many do not make it and are trapped on the Earth Plane. Hi i was lying with my husband one evening and noticed a strange tiny lump in amongst his bicep muscle. He has a tattoo where this object is but there is a oval shaped scar maybe a pinky finger nail big. He knows for a fact that when that tattoo was do e the rose pedal was shaded and now it is not because of this scar. But you can only really feel this object (fkrst thing i thought of was a transmitter) a teeny little silver cube with a smaller red cube on top. Thats what immediatly came into my head when i told him about it. He knows that hes never been hurt in that area or had any wound. Its only like 1millimeter big the top part very tiny. But who do we go see about it!? British Columbia, Canada! I don't think that I have been abducted,but I've had a close encounter with one. It was about 100 feet over my head and absolutely no mistaking of what it was! There was physical aspects to it as well,like a sense of euphoria and heat among other things.That was about 12 years ago. I had a more recent experience as well. I was out walking my dog late at night when I heard look up inside my head and was instantly directed to one far away,very strange. Any how check out this guy L.A. marzulli he was with Dr L for many of these procedures and has some great answers to who these beings are. God bless. I had a dream one night last year and just tonight after hearing similar stories have finally concluded that this dream could of been me getting abducted by aliens. Unknown origins! I was in my bed one night I dosed off to sleep with me lying on my back facing the ceiling and all of the sudden I was been operated on. All I could see was arms and rubber gloves with hands over my face but looked almost hospital like. There was a bright white light in the corner close to my face. They were wearing white gloves and some had blue gloves on. I never sore there faces just there arms and human like hands. I felt out of it like I'd been drugged by there medication. They kept twisting my nose at the top where the bone is it was exsreamly painful like my nose was going to pop with the pressure they were inflicting on my nose. I don't remember them doing anything else but using silver spanner like tools on my nose. I woke up with my nose throbbing. Its so strange and 8 years before this exsperienced a dream of a UFO hovering outside my window it was green very small before shooting off then this happens to me years later. I think they have been observing me and then picked me for research. I think they know we talk about this and i wouldn't be surprised if they get me again to do thurther experimental things in me. Its all very strange out there. i got all the symptoms of someone with an implant, i got lots of scars that i dont even know how i get that especially in my both arms close to my wrist,my head, etc. i even got a big lump in my arm that i dont know how i got it too?i got this strong static,sometimes my lights will just blink on and off then sometimes it just turn off too,id seen sometimes this kinda like bright light glance on the side of my eyes,im a negative blood type too,i got this sounds almost everyday everytime non stop,and its diff. sounds mostly pitch,it sometimes kinda loud and high.Most of all id seen ufo ever since i was a kid not just once,and i got nightmares,mostly i cant move,almost every night or everytime i sleep,i just dont wanna say it here,coz i know its easy for them to do what they want to do to us when we are sleeping. Honestly we all have all this things or symptoms happening to our life,sometimes im thinking if we are some sort of lab rat or experiment or what?And who can help us especially with this implants in our body?I know Dr.Roger Leir was the only one i know off who use to operate people to take out that implants but hes gone now (decease),so who can help us?I believe in hope, and im hoping that theres someone out there whose kind and brave enough to help us just like Dr. Roger Leir, Ive been searching for someone who can operate someone like Dr.Leir but i cant find one yet,coz i know theres a lot of people like me whose desperately wanna get this out,this implant in our body. Anyone?anybody?PLEASE HELP US. @4vrnite - why have no conventional doctors ever found any alien implants? Just a thought. If there were any, surely you could go have them removed and checked out? Mark. B Yes it's happened to me my entire life. The earliest I can recall is around 6 years old. I would completely be paralyzed in my bed. I could feel things being done to me, I could hear noises. It happened often during my teenage years. I told my mother this was happening to me and she said the same thing happened to her often. I was also born with a hole over my ear which i was told by someone that its an Alien marking. Ive seen ships twice in my lifetime. Ive been given many explanations by people who ive told my story to. Ive been told that I have alien dna due to my mother being experimented on, I've been told that I'm being followed by them and tested. To be honest I, know what it is or why they chose me but I hate feeling venerable to them and having no control over the next time they come to me. I wish I knew how to fight them back. Perhaps the research labratories that examined these implants, perfectly unbiased, by not having been told anything about them, as to start with a fresh sheet of paper should have the opportunity for a second look after being informed that they were removed from an alleged alien abductee, andhave specialists from other fields present.It seems as though the exercise might yield a different result.Even if they could not understand it's operation, or could not make the device functional, they could mull over the question of, if not from a meteor then where did the material originate.Im certain that spectrographic analysis, as well as other accurate tests could prove the purity of the material and the equal distribution of the material surely would prove this was not a random construct of a meteor. By my criterion that would represent the smoking gun. I have seen and experienced UFO's several times over the yrs not just in Scotland but in other places in the world so either it's a real phenomenon or a real mental condition or something else just as sinister where I have been "used" as I have experienced missing time on several occasions and also dream like states and I have been witnessed "doing things" awake where I remember nothing other than bits possibly made up in my own head to fill in the blanks. I am no kook unfortunately but I am the real deal. There most definitely is more to our reality than we know, I went on the defensive for a few yrs chucking it out over the fence denying aliens and such like but there is too much out there in our everyday realities to just simply ignore this besides I enjoy this it's part of who I am. I would try and explain it away as part of a subjective reality as a lot of the content you read and view can have that impact of affecting your subconscious reality however given a lot of things happened prior to my search for truth I would dismiss some of that , it would seem searching for truth followed by denial and then complete acceptance is a natural path for anyone interested in the psychology of the matter (previously a scary matter for me) but it is what it is and there are more people connected and involved than you realise my advice is to keep quiet and observe what goes on around you if in doubt, once seen it's difficult to unsee, there are too many connections in life to be just merely coincidences. A bit of a ramble folks but people need to realise that there is psychology involved and that it also needs to be accepted by everyone connected on such a delicate subject matter. Since 2013 I have been getting heavy energies coming into my head and going through my body. The more this happens, the more empty and less human I feel. I believe I was 'inserted' here for this very purpose: shortly after birth my brain experienced rapid growth, a years worth in the space of a few days. I believe I may also have an implant near my right shoulder blade. It is a spot that is always itching me. I can't get help or support from anywhere and I am seriously contemplating suicide as the only option left. I used to laugh at people like myself, but we really are to be pitied, caught as we are between two stools. I to have a implant in the palm of my right hand that's located between my thumb and index fingure. I was abducted in August of last year for the 3rd time that I can remember,but now I have this thing in my hand,and they are no scar on how they got in there, but I know they are monitoring me for some sinister reason cause I have had more than 10 surgeries and 3 cancer surgeries, I do believe now they are the reason for it all. I was never sick at all til I saw that first I do and missing all that time the first time I remember being taken 20 years ago. I can tell when they are close that thing will heat up and vibrate and glow a bluish grayish glow and when it just vibrates I end up with a lot of time missing on average 4 hours at a time. I do believe they are watching me all the time. what I can't figure out is why am I so special. I just wish they would leave me alone. I used to be the biggest skeptic about ufos and aliens cause it has went against everything I was taught and learned. but I'm a believer now, how can you not say something doesn't exist when it's right in front of you and your looking at it. All I know is I have felt crappy ever since this thing was placed in me.I want It out and for them to leave me alone. If someone reads this that can help, please help, please. When I was 5 years old I shared a bed with my sister. 30 miles south of Seattle in Washington state. 1984.It was the middle of the night and a very small being came in the house then into my house through the front door. Which was adjacent to my bedroom door. then into my room. Very slowly and quietly but he was breathing deep. Heavy. Labored breathing. I was on my stomach paralyzed. With fear. But also literally I couldnt move. He or it pulled the covers off my back then lifted my shirt. And poked a hole in my spine in the middle of my back. I could see my sisters face in the dark lying next to me. She didnt wake up. The next thing i knew it was morning and i told my mom that a small creature had poked a hole in my back. I remember lifting my shirt and showing her and she said theres a big scab in the center of your back your fine. She made a face that said. Idk what else to tellya kid youll live. I remember going to the big mirror in the hall and looking at my back and a big perfectly round scab in the middle of my back. It itched and healed quickly and fell off. Around this same time i was constantly waking up in the middle of night with nosebleeds. Sometimes the blood came out very thick like strawberry jam. This being that poked the hole in my back couldnt have been more than 2 feet tall. He could open very large door. He somehow paralysed me. Has anybody else had this same kind of experience. Hey Cyn, just wanted you to know that I too have RH negative blood & found on X-ray that I too have been chipped.Along with being drained of all my energy on a daily basis,I have 4 autoimmune diseases to deal with thanks to all this.Is there anyone else that's going through the same? I just want these implants out! They are sucking the life out of me. It's been over 3 years something has razed me about 5 times or more like electromagnet and it paralyzed me while it was projecting all this electro into my4 head. I'm miserable. Doctors won't help what can I do? besides all this talk about alien implants can some one get to the point and just say what type of electronic gadget would locate any implants under the skin besides ultrasound and looking a right fool at the hospitals the implants must have a wave length to knock out so it becomes useless come on people stop all the talking and more action for those that have been effected. I beleive I've been abducted several times over my life, I'm currently 28 years old and have had crazy dream like states since I was 7 when my family was driving home down a back road. We were heading home it was 630 at night, suddenly my dad screamed something and said there's a ufo. Suddenly the van was covered by a light I hid down on the floor. My entire family froze and didn't move. I remember seeing something outside the window then bam were driving down the road again and now the clock says 830. Since then I beleive I've been visited more. I believe the every 7 years they're visiting me. There's definitely a link with RH-blood. I have it - I don't feel the contact is negative with me though. What I do feel is some conspiracy with RH- and autoimmune disease. Anyone on here with both ? Im just looking for some answers, if anyone can offer any suggestions I'd be grateful. I have this pain in my left leg all day, I later showed my wife and she found a 11cm scar on my outer left calf that looks like I've had surgery; a small white scar that looks like a puncture on the top and back of my calf and higher up my there are are up two lines approx 3 cm going down. Wierd thing, is I dreamt last night I had surgery on my leg! Now unless my wife has been operating on me without me having knowledge some else is going on! I am under 24/7 surveillance by a large number of what I believe are greys.They are not malevolent, but they won't go away. When I get into my car, they show up there. I tried checking into a hotel just to get some sleep, they showed up 15 mins after I checked in. They abduct me 2-3 times a day. They can even operate my computer from watching me so closely, changing tabs. I have prayed so hard asking for God's divine intervention and for angels to give me some quality to my life, but I see no response. I don't know what else to do. I really, really need help. I tried going to the hospital asking that they look for the implant. They took me to the psych ward and, took my phone and locked me away until I demanded an attorney. Then they set me free. I have caught these creatures on camera abducting me and was told it could of been something I staged. I found an inscription in my bed just before they revealed themselves to me. I began swinging at hitting at them and they shot me in the neck with a mild tranquilizer. The foot tracks are all over my carpet showing exactly where they are entering. When they feel like it, they release that awful smell that makes me drowsy, then they put something in my eyes that burn and makes me fall asleep almost instantly. With so much evidence, I can't get relief anywhere. Please someone help me get rid of these things.I have been an abductee for almost 60 years. If anyone has any advice, I am willing to hear it.